Who is ready for Halloween? Its still August but word on the street is that Halloween is at the newstands. Thanks to ABCD for alerting me that the October issue of Martha is somewhere out there waiting for me. I admit, I've been a little let down by some of the more recent MS Halloween issues, I can't help but look forward to it each year. So I guess this means I better get going on my Halloween projects right? For those of you who go all out - have you done anything yet? Put me to shame (and light a fire under me please!) by sharing your progress and projects in the comments. I'm utterly depressed, thanks in part to your inspiration, the hubby and I were going to go all out with a haunted house this year but due to HOA woes, we're now throwing our money muscle behind a xeriscaping project for the front of the house. Which is all good and well...I'm just bummed that we have to scale back our HH plans. We are doing a Godfather theme this year, so you know, I have been drinking wine to prepare for it! HA! Looking forward to your halloween ideas! I have been disappointed by the recent Halloween issues too. Too many repeats from previous issues. I'll still stop and flip through it to see if there is something amazing in there but I didn't even purchase a copy last year. Hopefully she came up with something new this year! I picked up all of the supplies for my Halloween projects but I haven't gotten started on them yet. Time to get working! I'm always super jealous of your Halloween invites and decor. I LOVE Halloween. I live in Salem, MA, so I guess I better love it. One of my favorite things to do for our Halloween parties is to go all out decorating our bathroom. It's a small space, so it's easy to make a big impact with it. Last year it was kind of a murder scene, tub filled with ice and fake body parts, bloody hand streaks on a cheap shower curtain, HELP written on the mirror in blood. The year before our bathroom was "the body bag". We covered the entire bathroom from floor to ceiling with black trash bags, including the back of the toilet tank, around the sink and everything. Then we put red light bulbs in to replace the regular ones. Some people didn't even want to go in there, it was pretty freaky once you shut the door. Walling off the shower with the black trash bags made the room really narrow and kind of claustrophobic. Definitely creepy and it was really cheap to do. I may just have to go buy this. I am always obssesed with MS Weddings for some reason. You throw the best Halloween parties! I too am I total Halloween-aholic, and have already started planning our annual costume party. In fact, I placed the order for our invitations yesterday! I don't have any idea for our costumes yet this year, and since our party will be on Oct. 8, I'm feeling a little behind schedule. Thanks for the heads up that the MS issue is out. I borrowed the bee keeper idea from Martha a couple years back. I can't wait to see what you have in store for us this year. I love your Halloween ideas! I saw pictures of your Halloween decor and last year's party in a Halloween magazine that I happened to flip through this weekend!! Amazing job!!! I especially loved the tiniest twin invitation! OMG OMG OMG I must find it! I've already bought the Better Homes and Gardens issue for this year! Love Halloween! I am so excited for Halloween! I get a lot of trick or treaters where I am. I like to be in full costume to answer the door. This year I am thinking a creepy version of Toddlers n Tiaras. I won't have to do a lot ha! I've been ready for about 4 months now! October is the best month!!! It's still 105 degrees here....I can't even think Fall, let alone Halloween. But I love the holiday, so I hope I get in the spirit soon! My husband and I are Halloween fanatics. This year we're going to try to do Madame Leota and the seance scene from the Haunted Mansion at Disney. I've seen it done and it's a little complicated but the effect is so worth it. So very excited for Halloween!!! We have been planning our costumes all year & as soon as the weather started cooling down last week, I had to put a few decorations up! Can't wait to checkout this magazine! I am very excited for Halloween!!! i picked up the magazine yesterday .... I have to say disappointed again. Oh Martha! I am definitely getting into the spirit of halloween. I've already bought a shiny black candelabra, a glittery pumpkin, and I'm in the process of making a black tulle wreath! I can't wait to see what you come up with this year! Martha was disappointing but I did enjoy your article in Women's Day!! 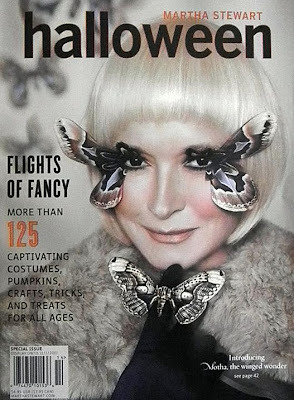 I was disappointed at last years HALLOWEEN MARTHA STEWART...but to answer your questions YES I'M READY! :) It's my favorite holiday! I CANT WAIT! I'm so ready for FALL Temps! Wow, that sounds complicated! I'd love to see it.